It's early in a new year, and that means a wave of fresh computers are on the way. 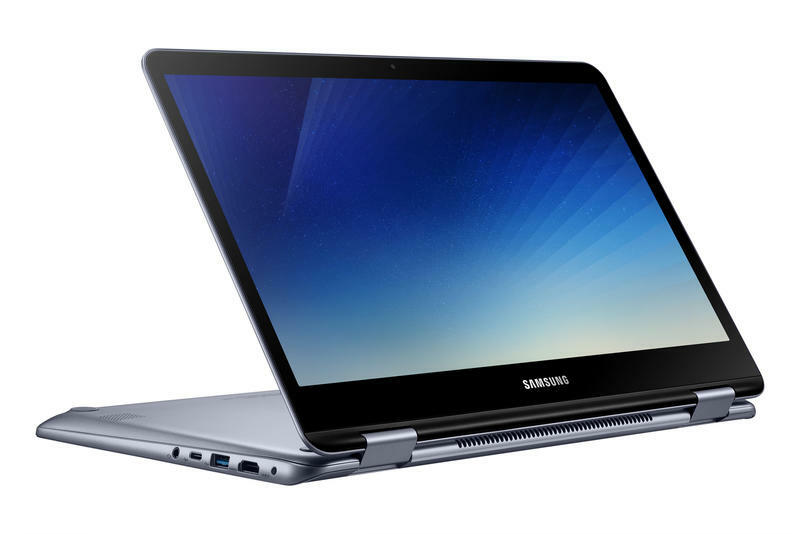 Samsung quickly jumped to upgrade its lineup with three laptops. 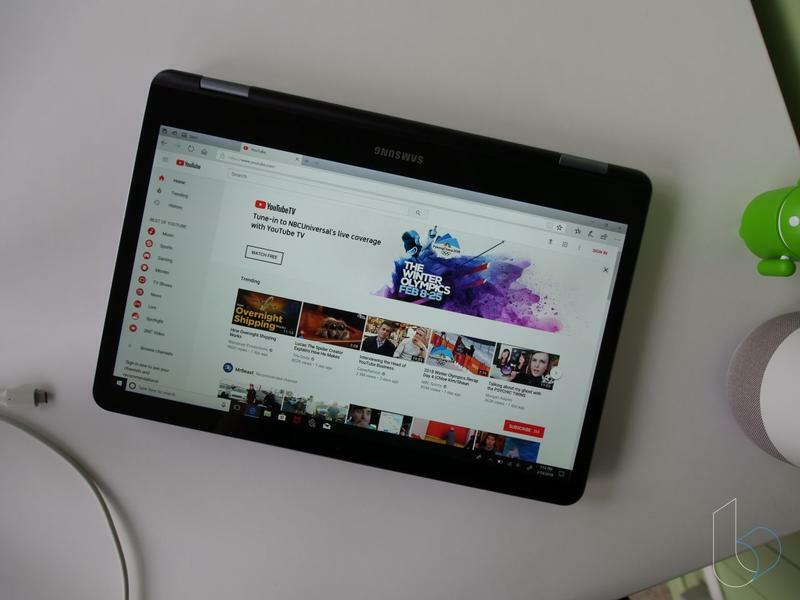 The Notebook 9 received various improvements to be more premium, and the company introduced the Notebook 9 Pen for anyone begging to have the flexibility of a tablet while keeping a laptop's power. Those two, however, are on the expensive side. That's why you also have the Notebook 7 Spin to consider. The new Notebook 7 Spin doesn't mark the arrival of a product we haven't seen before. It's still a 2-in-1 machine, but in 2018 the internal specifications are refreshed with an Intel 8th generation Core series processor and productivity-driven software features. 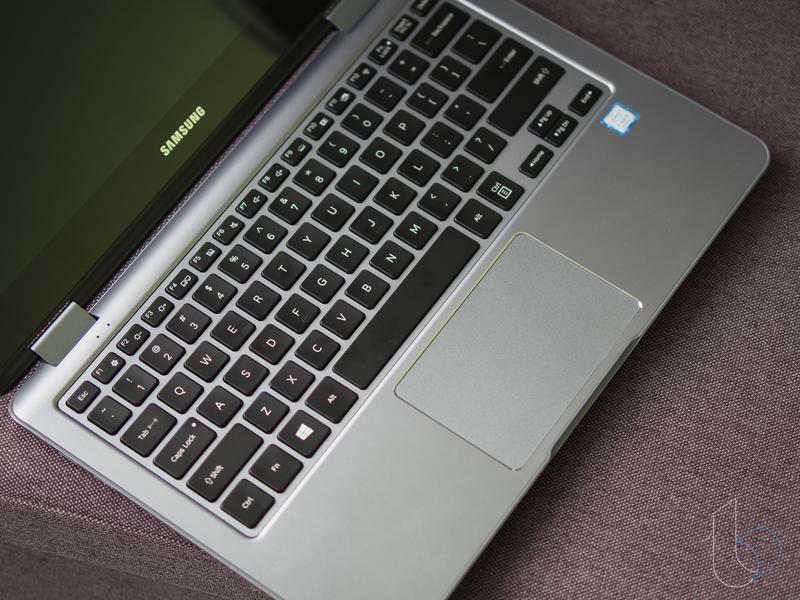 Samsung isn't going after those who want a cutting-edge laptop. The Notebook 7 Spin is modest in every way, and that's fine. It's a laptop that, on paper at least, should be a fit for students and professionals just trying to get work done with the option for light entertainment. An all-metal body greets you when opening the Notebook 7 Spin's box for the first time, but it's not exactly the most premium-feeling take on aluminum we've seen. The material feels rather thin here. When you press on the lid and the bottom's center, you'll feel flexing in the metal. So there's no rock-solid feeling, which is worrisome in the event your Notebook 7 Spin takes a dive. 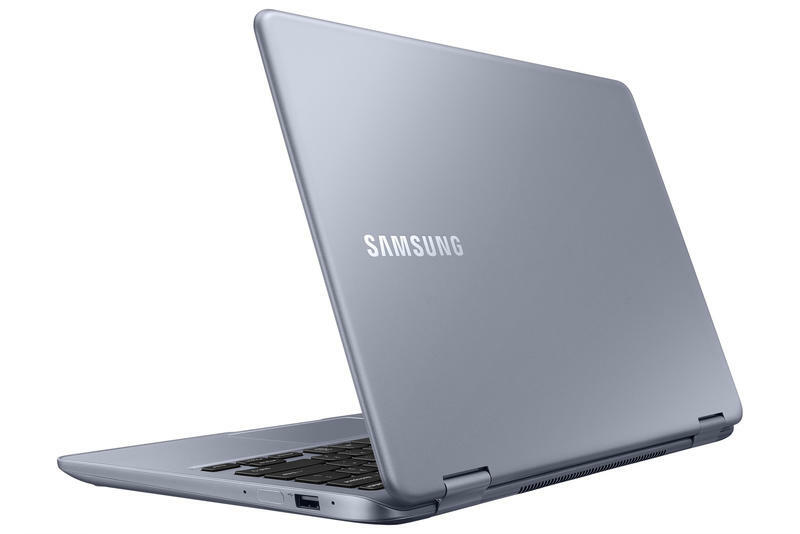 As a whole, Samsung's laptop goes for an industrial look while others are embracing more modern vibes. The Notebook 7 Spin doesn't have sharp edges. Its edges are rounded and the color, called Stealth Silver, doesn't pop. It's definitely worth noting, too, that the rubber feet underneath the laptop aren't very grippy. On various surfaces, the Notebook 7 Spin managed to slide around easily. If you're someone who presses your hands down while typing, it's likely the laptop will shift. It seems the rubber feet are way too soft and thin to hold the laptop in place. We've seen the way Samsung's evolved its design for mobile devices. It'd be great to see the same happen for its computers. Laptops like the Surface Laptop and MacBook are priced similarly yet present themselves in a much more attractive way. 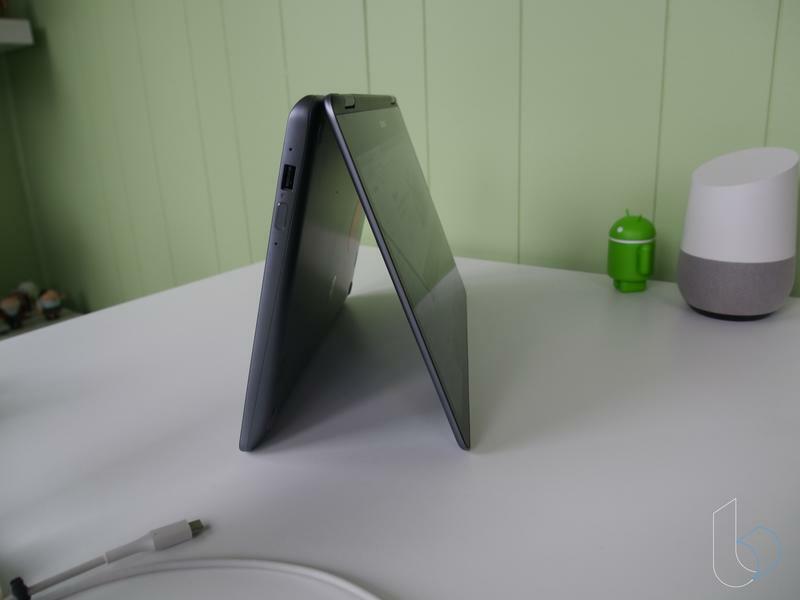 On the plus side, the Notebook 7 Spin and its unassuming design might be suitable for consumers. The laptop carries its weight (3.2lbs) very well and the overall footprint is compact. 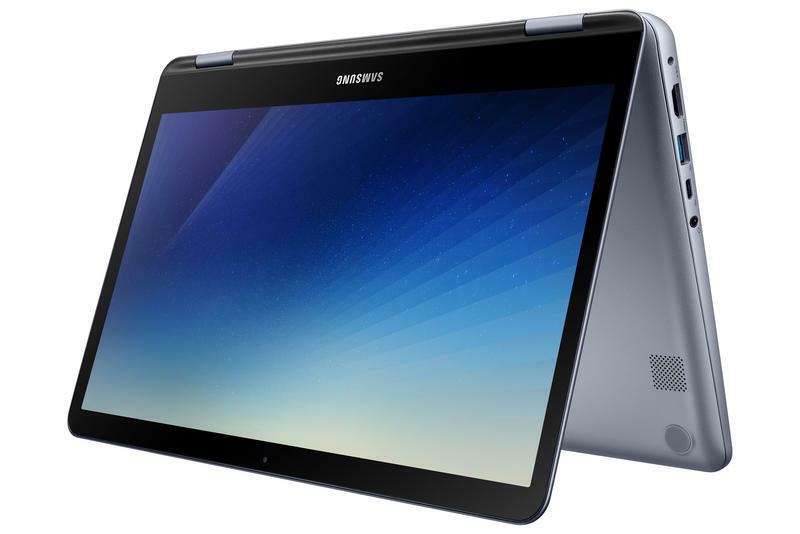 Samsung also added a healthy amount of ports to separate itself from Microsoft and Apple's respectable entry-level laptops. Along the left side are HDMI, USB 3.0, USB-C, and auxiliary ports. Over on the right side is a USB 2.0 port next to the power button that doubles as a fingerprint scanner. Connect a bunch of devices? Give a lot of presentations? All of these ports should suit you nicely. 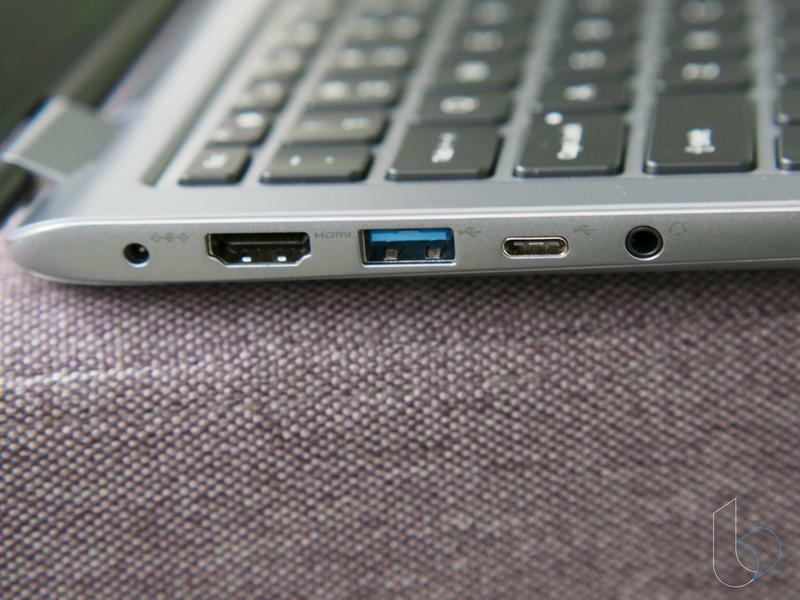 If you're thinking about purchasing this laptop, it's obviously because of the hinge. After all, this is basically Samsung's marquee hybrid. The Notebook 7 Spin's display rotates 360 degrees to convert the laptop to a tablet. Stopping anywhere in between lets you position it in 'tent mode' as well. There's just one problem: Samsung doesn't give you the Active Pen. So getting the absolute most out of your Notebook 7 Spin requires an additional purchase. It may seem random to call out, but whoever supplied the hinge on the Notebook 7 Spin deserves praise. When you're not in tablet mode, the laptop lives like any other laptop but with a touch-enabled display. Surprisingly, it doesn't noticeably wobble during any interaction. That's a good sign for folks who plan on constantly switching between laptop and tablet modes. Over time, the hinge should remain tight. The keyboard's pretty average. I've used Microsoft's Surface Book and Surface Laptop a ton since late 2015, and those computers provided comfy experiences for long typing sessions. Laying your wrists on the Notebook 7 Spin's metal is welcoming, but the keys lack a satisfying click. It's also backlit, if that's any consolation for the underwhelming feeling of typing on this laptop. Samsung let me down with the 13.3-inch display. For years we've all been blessed with gorgeous colors and sharpness on the Galaxy S and Galaxy Note series' Super AMOLED technology. Did the company decide laptops don't deserve the same love? The Notebook 7 Spin features a subpar display that's really reflective, really dull, and surrounded by thick bezels. On top of that, the Full HD (1920×1080) resolution also means it's not very sharp. It's conflicting because at first you don't expect higher quality since the Notebook 7 Spin isn't the Notebook 9 or Notebook 9 Pen. Then you realize the price is $899, for that amount of money you should get a better display. Colors should be vibrant, not lifeless. For whatever reason, audio is also a bit of a mess. The sound coming from the laptop is empty and vibrates the entire body. Again, it's bad for a laptop this expensive. When you're paying nearly $1,000 for a laptop, it better make videos on our YouTube channel look and sound as intended at the very least. There's no excuse for Samsung to fall short here. As is the case with the other two laptops in the company's 2018 lineup, the Notebook 7 Spin includes Intel's latest processor. It's the quad-core Core i5 paired with 8GB of RAM and 256GB of storage. The processor belongs to the U series, meaning the component is made specifically for thin-and-light machines without feeling underpowered. Performance meets expectations, especially for someone like me that doesn't carry out demanding tasks. Students and the majority of professionals shouldn't have any problem getting work done with the Notebook 7 Spin. 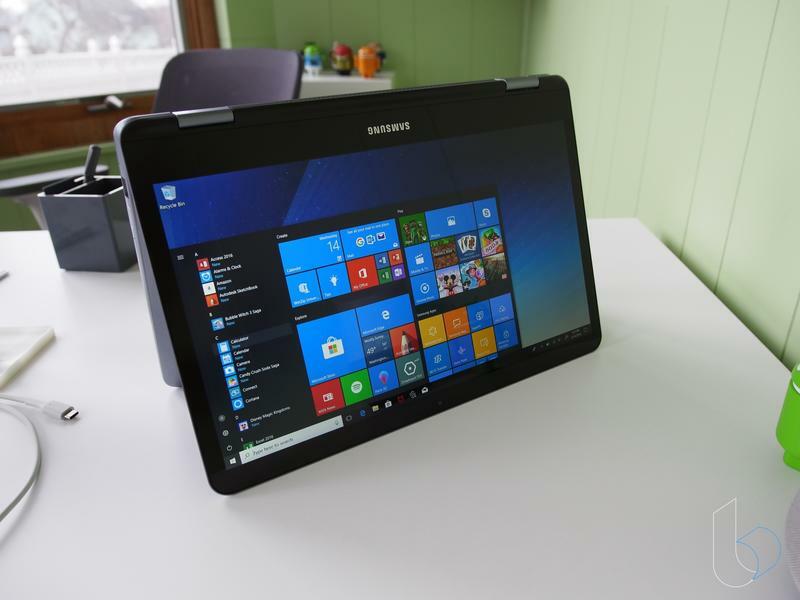 The laptop is particularly helped by the jump from a dual-core to a quad-core layout for the main processor. 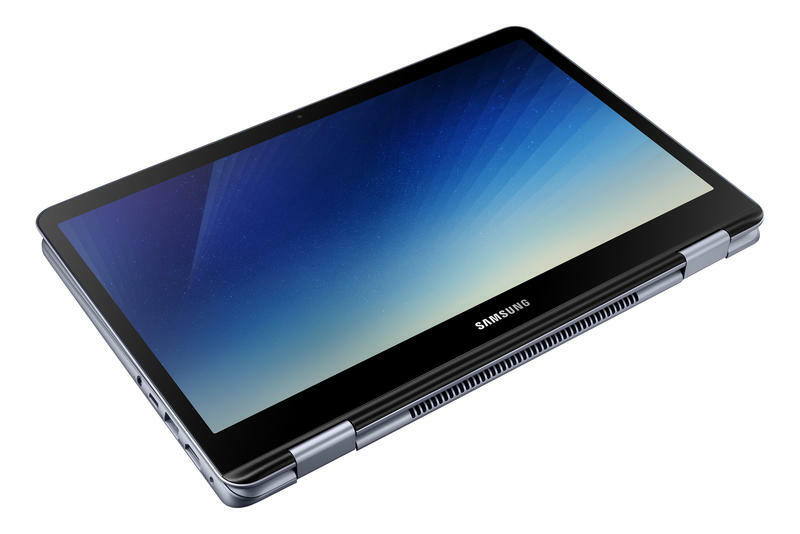 Samsung's 2-in-1 goes through web browser tabs, Office files, and Skype at a good pace. The integrated graphics chip comes from Intel, too. You're getting the HD Graphics 620, so you can rule out gaming for the most part. If you want to dip into gaming on the Notebook 7 Spin, stick with lighter titles and maybe only ones offered on the Microsoft Store. Products for students and professionals have to be long-lasting. Students can't have their laptop die in the middle of a lengthy lecture, and professionals can't be working on the road if they're constantly attached to wall outlets. 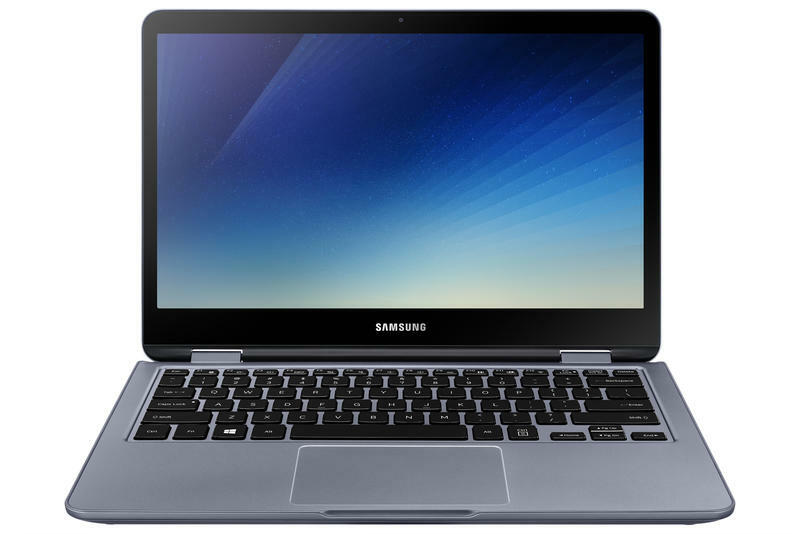 Fortunately, Samsung nailed battery life for the Notebook 7 Spin. 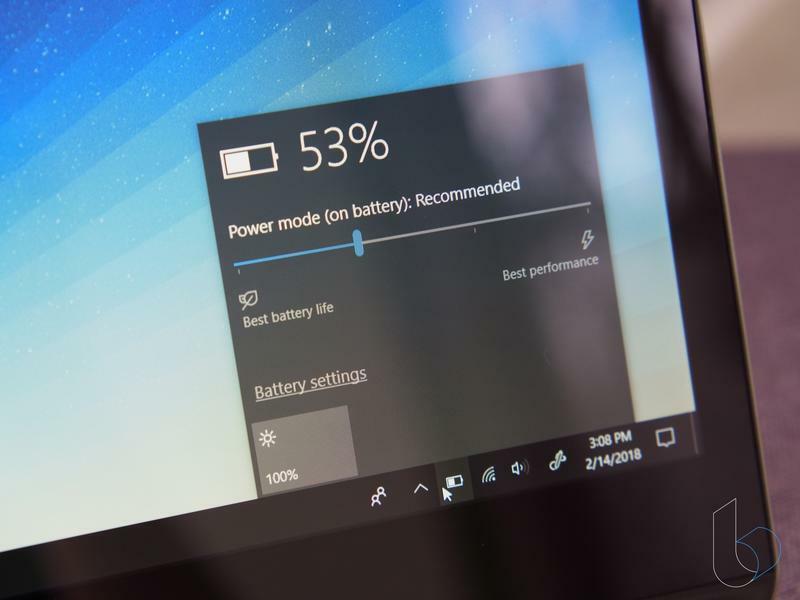 The 43Wh battery gets you through the day easily, especially when leveraging Windows' power modes. As I often say, Windows is Windows. The software on different computers remains identical, but Samsung did go overboard with pre-installed apps and services. A lot of them aren't even from Microsoft or Samsung. On our review unit, we discovered a number of games as well as McAfee installed right out of the box. Students might like this, but few professionals are spending their time playing Bubble Witch 3 Saga or Disney Magic Kingdoms. Other key software features that are potentially useful include Voice Note (audio recording), Samsung Cloud (cloud storage), and Studio Plus (media editor). The Notebook 7 Spin does indeed have Windows Hello except not through the front-facing camera. It's integrated into the home button that also reads your fingerprint. Honestly, that's a nice addition for the laptop to keep up with the competition in some capacity. The Notebook 7 Spin is versatile. That's not enough to be unique anymore. When you look at the rest of the laptop, it's disappointing. 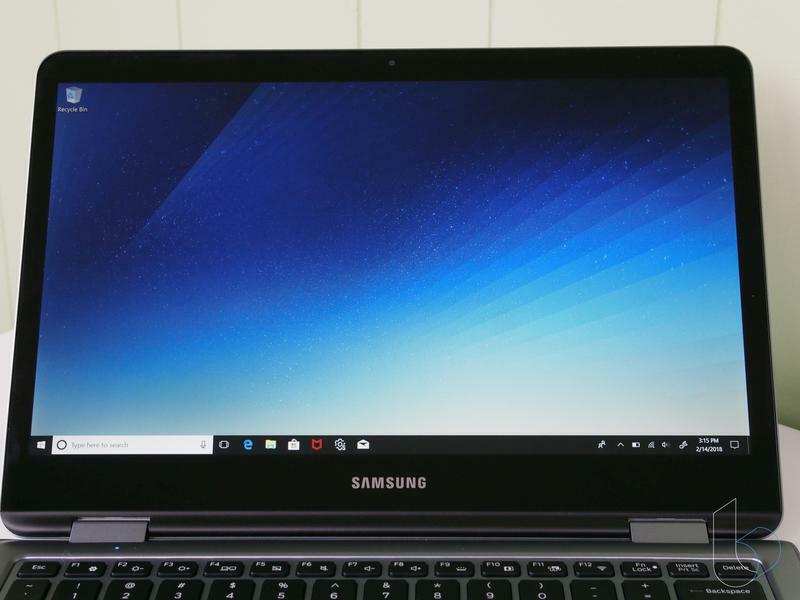 Samsung attached a hefty price tag to a laptop that's not attractive and comes with a display you wouldn't expect from the company. Shoppers willing to spend $899 on a laptop probably have wiggle room. Add around $100 to the budget and you're better off choosing the Surface Book or MacBook. 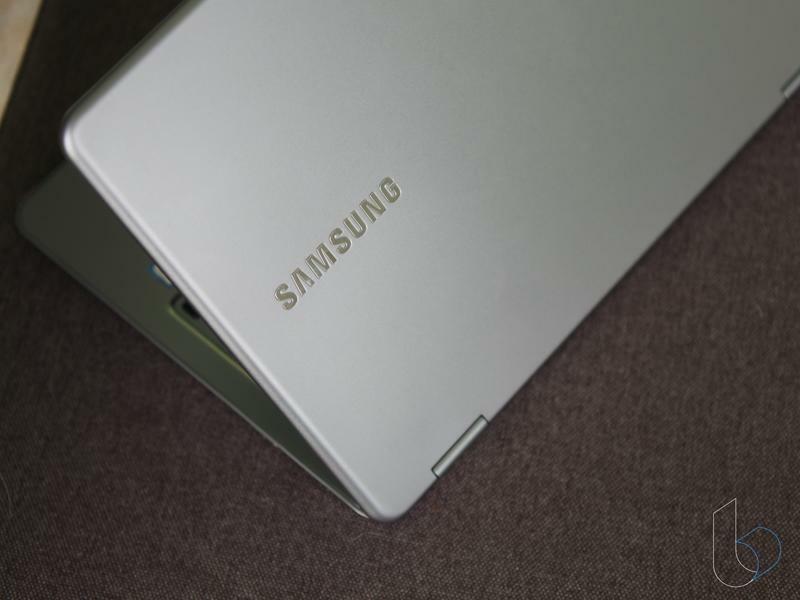 Better yet, you can save money on a hybrid of the same quality as Samsung's Notebook 7 Spin. Brands like ASUS, Acer, and HP all make 2-in-1 machines that match the Notebook 7 Spin in quality but shed hundreds of dollars from the price.